By the year 2025, one billion people in the world will be diagnosed with hypertension. According to the research, this translates to one in four adults in the world population. High blood pressure can really be a health risk for a person if not monitored consistently. Physicians warn that early diagnosis, medical intervention and blood pressure log tracking all work together to help the person control the condition. You can get your own printable blood pressure log for free here. Most people find the blood pressure tracking process to be cumbersome and difficult. When a blood pressure log is used, the person may find it easier to track their results. Using a blood pressure log printable style takes the guesswork out of managing the blood pressure and tracking the results. This is especially helpful for those who will be required to maintain a blood pressure printable log for a period of time to keep their doctors in the loop about their progress. A printable blood pressure log monitors progress over time. When a person has been instructed by the physician to work toward a blood pressure goal or log results daily, the printable log organizes and consolidates the information in a presentable format. Blood pressure log printable templates are convenient in that the person can store them for long-term purposes. Some people who will have to work closely with their physician for a long period of time will likely need to keep multiple logs. 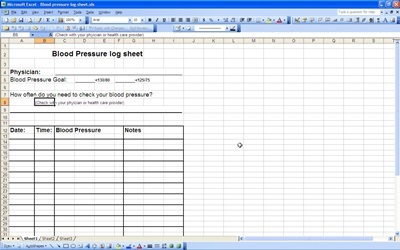 The blood pressure log template can expand to meet the person’s needs. Convenient fields to track any important notes along the way will simplify the tracking for the person using the printable blood pressure log. When the doctor instructs the patient to begin using a blood pressure log, the easiest method in doing so requires the blood pressure log printable format. A printable blood pressure log simplifies tracking, monitors progress, and serves as a great way to manage blood pressure levels long-term.